Less than one hour north of Atlanta and located off highway 382, (Ellijay, Georgia) Covered Bridge Estates gated community is centrally located between Carters Lake and Gilmer County Airport at the base of the Appalachian Mountains. Those who desire the rustic mountain settings of a traditional craftsman style home yet also yearn for the sleek elegance of modern design will be excited to see the new models now available at Covered Bridge Estates. Bridging the gap between masculine and feminie, the clean lines, open floor plans and modern finishes add to the minimalistic aesthetic that make the new craftsman contemporary homes at Covered Bridge Estates such an exciting addition to the community. By combining Craftsman-inspired home design with modern floor plans, highly sought after amenities and timeless finishes, residents can enjoy the best of both worlds. The new designs are a balance of craftsman history and open floor plans that focus on the great rooms and kitchens as the central gathering point. Stone piers and foundations with painted columns, grand master suites offering spacious master baths and closets are available on an array of 1 to 3 acres wooded home sites starting in the low 30’s. 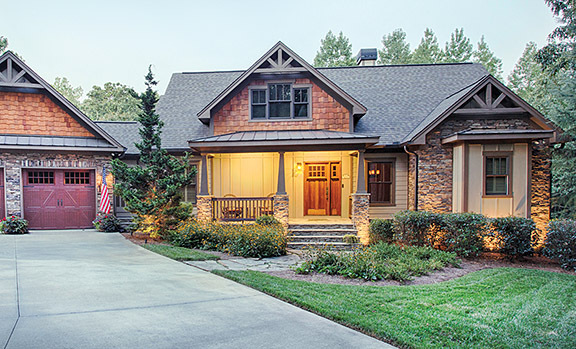 Of course, those who prefer the traditional rustic feel and look of a craftsman style home can revel in the many taylor-made design choices offered at Covered Bridge Estates, starting in the mid 250,000s. A fad lasts 1 to 2 years, a trend lasts 10 to 20 years, the homes in this thriving community offer the tranquil benefits of seclusion while being on the cusp of emerging trends. Only 25 minutes away from Cartecay Vineyards residents at Covered Bridge Estates can enjoy wine-tasting, live entertainment or take a stroll through nearby Ellijay’s historic downtown and visit the many outdoor cafes, antique shops and more. 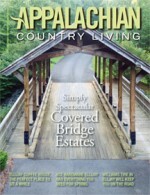 For those seeking adventure, Covered Bridge Estates offers unparalleled proximity to Georgia’s most fascinating and scenic outdoor activities such as Appalachian Trails including Tumbling Waters, Oak Ridge Nature Trail and Bear Creek Trail. Visit the highest waterfall east of the Mississippi at Amicalola Falls State Park or spend the breezy day swimming, fishing or jet skiing at Carters Lake. Interested in seeing what Covered Bridge Estates has to offer? Schedule your visit today! Proudly boasting paved roads, underground services, including water, cable, telephone and electric already provided to each individual home site, calling Covered Bridge Estates your new home is easier than ever. You are encouraged to bring your own licensed and insured contractor or use one of the Ellijay’s suggested builders. Jackson & Associates is a licensed and insured General Contractor in Georgia and Florida and has been involved in the construction and renovation of nearly a thousand residential units. Tom Jackson and his team are capable of building dream homes such as log cabins, cottages, high-rise condos and more. Jackson insists that whenever possible, his firm prefers to work with qualified local tradesmen in the community who are vetted by the subcontractors on site. With John Allen of Brown Haven Builders breaking ground on November 15th, Covered Bridge Estates continues to grow. If you are interested in constructing your traditional or contemporary craftsman style home in Covered Bridge Estate but don’t have your own architect, our team can help you design and build your dream home. Come explore the serenity and beauty at Covered Bridge Estates today.